Situated on its own private Island, Waterford Castle Hotel & Golf Resort offers a luxurious accommodation in the South East of Ireland. Along with the superb Hotel facilities, you can enjoy the 18 hole Championship Golf Course, or choose to stay in one of the Castle Gardens holiday homes. The 800 year old Castle comprises 19 spacious guest rooms, which offer luxurious accommodation & stunning views of the surrounding estate. The award winning Munster Dining Room in the Castle Hotel offers the perfect setting for a wonderful dining experience. One of Ireland’s most acclaimed hotels, Waterford Castle has welcomed and charmed the most discerning travellers for decades. The castle is a legendary luxurious retreat of world class standing, offering superb accommodation. Experience a wonderful sense of anticipation as you make the short crossing by ferry to the island and travel the beech-lined drive to the Castle. 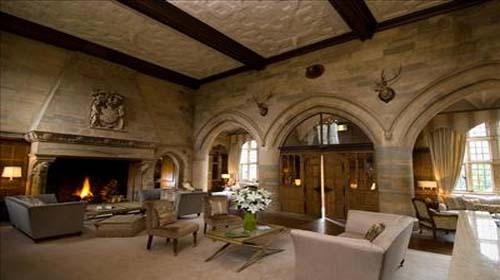 As you enter the massive studded oak doors you will be embraced by the Castle’s 800 year history, the carved stone and wood panelled Hall, with its Jacobean style antiques and intricate original tapestries. The traditions of the Castle are honoured in the décor of the 19 elegant bedrooms; each one offering gracious style combined with all the modern comforts you might expect of a world class hotel establishment. Each of the 5 suites has a private sitting room and 14 deluxe bedrooms are en-suite twins and double/kings. Rather than stay in the Castle Hotel, you may enjoy the privacy and freedom of staying in an island holiday home. These 3 bed, self catering holiday homes sleep 6 people and have been fitted out to the highest standards. The homes are available to rent now. Please contact us for the latest rates. Waterford Castle Hotel prides itself in the immaculate and personal style of service it extends to its guests. Indeed many of the team are second generation Castle staff; following in the time honoured service of their forebears. This dedication is endorsed by the many service accolades the hotel has received. 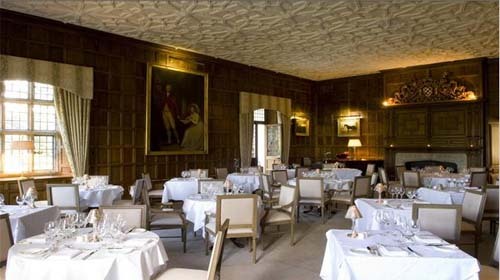 The warm ambience of the award winning Munster Dining Room with its wonderful oak paneled walls and ornate ceiling is complemented by a great cellar and exciting seasonal menus. Local produce and the talents of a highly acclaimed head chef create an intensity of flavours to savour and a truly memorable dining experience. Our resident pianist; playing most evenings lends to the intimate atmosphere in the Munster Dining Room. Dress code is ‘smart’ and a jacket is preferred for men. Relax in front of the large open fire in the Front Hall and enjoy a sumptuous Afternoon Tea. A selection of sandwiches, dainty pastries and scones with a choice of teas or Champagne is served from 12 noon to 4.30pm daily. We request that you make a reservation for Afternoon Teas. Receptions and Cocktail Parties may also be hosted in this great room. You could scarcely find a finer venue to enjoy hospitality in the company of friends or family, colleagues or clients. Waterford Castle can offer a number of private dining options including: Up to 22 guests can be accommodated in the Leinster Dining Room and 20 guests in the Conservatory. The Munster Dining Room suits private dining for up to 80 people. Wedding receptions, business or family celebrations are all catered for with individually tailored menus to suit the occasion; ensuring a most enjoyable experience for you and your guests. The Fitzgerald Room is an elegant yet comfortable and intimate room. A light menu including Smoked Irish Salmon, Warm Chicken Salad and Daube of Irish Beef is available daily until 9.00 p.m. Afternoon Tea to may be enjoyed here in front of the crackling log fire. Enjoy an aperitif or cocktail here while choosing from the dinner menu in the evening or simply relax here at any time over a game of chess or curled up with a good book. 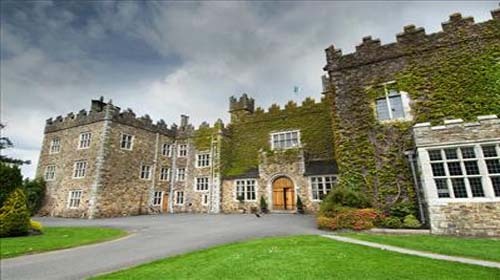 Waterford Castle Hotel provides a stunning venue for an unforgettable Wedding Day. Imagine spending your Wedding day in your own Castle on an Island minutes from Waterford City but a thousand miles away from the frantic pace of everyday life. Waterford Castle can truly boast an exceptional wedding venue; a legendary Castle on an Island Haven; exclusively yours. Each wedding is individually organized by our wedding co-ordinator who is always on hand to suggest, arrange and oversee every detail of your own personal requirements. Discounted Accommodation Rates for Wedding Guests all including Full Irish Breakfast the next morning. Marquee Weddings are also catered for on the Castle Grounds, for wedding parties exceeding the 120 guest limit. 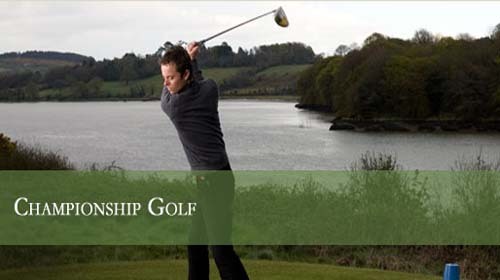 Waterford Castle Hotel & Golf Resort is not just a place to relax and unwind. It’s also full of activities both outdoors and within the Castle itself. Some walking paths have been set out to allow you to see the sights of the Island on foot. With a wide variety of wild life on the estate such as, Deer, Hare and Pheasant, each walk in itself will be a sight to behold. Whether you are a beginner or experienced, clay pigeon shooting is available for all levels with tuition and equipment provided. Complimentary for all residents on our outdoor court. Rackets and balls available at Reception. Boules is available on the Lawn adjacent to the Castle. Custom made picnic baskets can be prepared by our Executive Head Chef Michael Quinn and enjoyed in the vast grounds of the 310Acre Estate. 24 hours notice is required on all orders. There is an amazing array of Wild Life and country Fauna on the Island. Each trail offers the opportunity to spot some of natives such as Hares, Deer, Pheasant, Foxes and Swans. Allow yourself to enjoy the delights of Afternoon Tea in the Castle’s Conservatory while overlooking the formal gardens and the Islands grounds. Soak up the peaceful surroundings and unwind in The Lobby with it’s oversized couches giving you the comfort to simply sit back and take it all in or challenge yourself a little more with a game of Chess or Draughts. Take cover from the elements of the Irish Weather and warm yourself with the open fire that truly takes centre stage of the Castles original welcome hall. The Fire place wears the Fitzgerald Family Crest with pride, reminding all that for over 300 years Waterford Castle was a family home, a feeling that lives on in the minds and ways of all staff. Located on the island we have a games room for the kids to enjoy, including a pool table, fuse ball table and much more! Waterford Castle’s meeting & events facilities are ideally suited for small meeting requirements. There are a number of adaptable rooms that work entirely to your needs and goals. A dedicated Meeting Services Manager will be provided to coordinate every detail of your event. With meeting rooms available in both the 16th Century Castle and the Golf Club House, whatever the needs, each event can be tailored to accommodate. The Island Haven offers an intimate escape that will allow each delegate a stress free experience. The 310 Acre Island is the perfect setting for any outdoor Team Building day and specialised third party experts can be brought in to oversee all activities. The Island is a refuge for calm and provides the ideal environment to achieve goals, solve problems and focus on the task at hand. Pricing can be put together A La Carte or as a Day Delegate Package. For the ultimate golfing experience that will stay with you for a lifetime, Waterford Castle truly is an island dream! The unique Waterford Castle Hotel and Golf Club is Ireland’s only true island golf resort. Completely detached from the mainland yet ideally located for an Irish golfing vacation or exploring the many Irish golf courses nearby. On this privately owned 310 acre island, home of the world renowned Waterford Castle Hotel, sits a wonderful parkland golf course. Designed by Des Smyth, former Ryder Cup player, and opened in 1992, this 18-hole, par 72 championship golf course, complete with luxurious clubhouse, leads you through mature woodland and parkland. The course itself runs to 6,814 yards, off the medal tees, and covers an area of over 200 acres. Despite being completely surrounded by water Waterford Castle has an additional four internal water features on the second, third, fourth and sixteenth holes and we can even boast of having our own Swilken Bridge. Though not built by the Roman Empire! The layout reveals attractive rolling fairways and subtle contoured greens, magnificently blended into the sensational setting of this Island Dream! Waterford Castle Lodges are luxurious 3 & 4 Bedroom holiday homes within the 320 acre Waterford Castle Hotel & Golf Resort, superbly designed, the comfortable and stylish Lodges provide the perfect escape for all the family. Discreetly situated in a secluded enclave on the edge of the resort golf course alongside the 11th fairway and adjacent to the 10th green. The houses at Waterford Castle Lodges are available to rent on a nightly or weekly basis. Ideal for guests who enjoy having their own island home with all the space and privacy that affords, you can cater for yourself while having the benefit of hotel services on your doorstep for the duration of your stay! The island is full of activities for all the family. Explore the island and discover walking and nature trails. Enjoy a Picnic with one of Waterford Castle’s custom made picnic baskets. Challange yourself with our array of Garden Games: Tennis, Croquet, Boules. Enjoy a Game of Golf on our 18 Championship Golf Course. Test your shot with a lesson in Clay Pigeon Shooting. There is also an indoor games room on the resort for those rainy days. With animals from badgers to deer and even hare to be found, and birds from herons to pheasants living on the island, the grounds of Waterford Castle are ideal for entertaining the kids and, as the island is a completely safe environment that offers plenty of fresh air and exercise, parents will be happy too! For many the island is a destination in itself but should you want to leave its shores you’ll find plenty to interest you. Discover a historic city with roots in Norman times, where today commerce, enterprise and industry thrive. Waterford boasts a progressive Institute of Technology, excellent health care facilities at Waterford Regional Hospital and is home to the wonderful Waterford Crystal. Being renowned for its fresh produce and the wonderful seafood harvested from the wild Atlantic, you’ll find plenty of exciting restaurants to tempt you. Famed as a centre for cultural and artistic activity you’ll find a busy calendar of year round events – theatre, opera, festivals and music to suit all tastes. The glorious beaches and picturesque villages of the Sunny South East are on your doorstep, and racing enthusiasts will enjoy the thrill of a day at nearby Tramore or Gowran Park racecourses. Golfers will be spoilt for choice with other golfing gems such as nearby Faithlegg and Mount Juliet just a short drive away. Incidentally, Waterford City is probably also the shopping capital of the region.